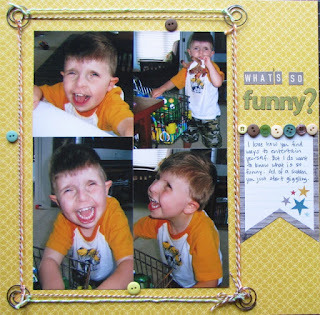 My Creative View: What's so funny? Out of nowhere he'll start giggling. It's the best giggle I've ever heard too. Just once I'd like to be inside his head so I could know what he is thinking and what's so funny! I love these pictures. But what else is new. I like every picture where he is smiling. When he smiles, I smile. That's just the way it works. I kept is simple, creating a photo block with the 4 photos. Bella Blvd PP, MME journal tag, OA and Sassafrass letters, random buttons. I got these metal clips in a mystery box swap. They are so fun and have lots of uses! Today I wanted to wrap the twine through them to create a frame around the photos. I wrapped brown all the way around. Then I added green twine on the horizontal lines, and orange on the vertical ones. Done! I like the journal banner & twine. Cute LO! Adorable frame! And what wonderful pictures!